StickyJ Medical ID Jewelry is a provider of Iowa Do Not Resuscitate (DNR) bracelets that comply with state regulations. The identifier bracelet is the key way health care providers and/or EMS personnel can quickly recognize that you have an Out-of-Hospital Do-Not-Resuscitate order. 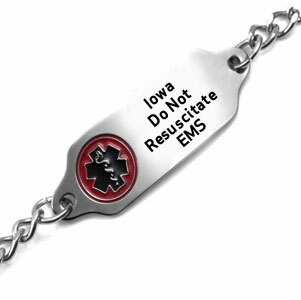 The metal bracelet displays the Iowa Do Not Resuscitate EMS message on the front, along with the universally recognized emergency medical symbol. It's recommended that the patient's first and last name be engraved on the back of the bracelet in the top line available. There is additional room available for emergency contacts, if desired. A copy of your completed Iowa Out of Hospital DNR Order must be mailed to StickyJ Medical ID prior to releasing your order. You can either scan the document and send it to us by email (CustomerService@StickyJ.com), or fax it to 727-490-5446, or mail it to: Customer Service, StickyJ Medical ID – DNR, 10801 Endeavour Way Unit B, Seminole FL 33777. If you have any questions, please call us at 727-823-9500. To order by mail, please download the Iowa Do Not Resuscitate Order Form and follow the instructions on the form.